Your existing plans, their descriptions and tags are displayed. 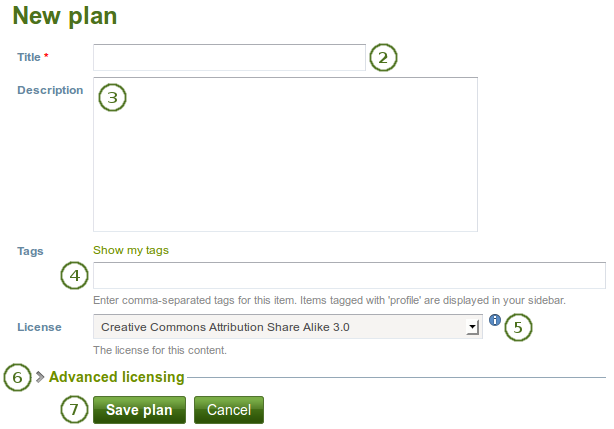 Click the Edit button to change the title, description, tags (and license) of your plan. 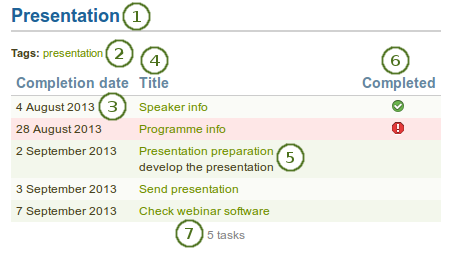 Click the Manage button to add and edit tasks for your plan. Click the Delete button to delete your plan. Completion date: Provide a completion date. Either choose the date via the calendar icon or enter it in the format YYYY/MM/DD (Year - 4 digits / Month - 2 digits / Date - 2 digits), e.g. 2012/06/27. 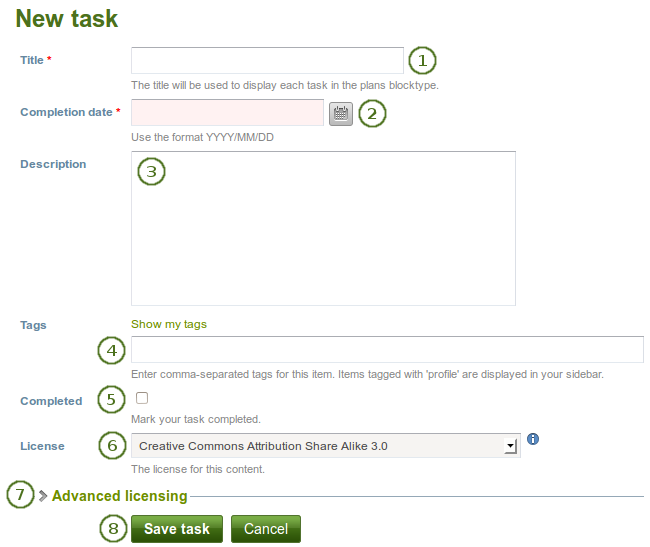 This field is mandatory and allows for tasks to be marked overdue automatically. Completed: Tick this checkbox if you have already completed the task. Completed: The completion of each task. If a task is complete, it receives a check mark. If it is overdue, a warning is displayed. Click the Edit button to make changes to a task. Click the Delete button to delete a task. Tags: The tags are displayed. When you click the title, which is linked, you can see the description for this task. Completed: You see whether the tasks are completed, not yet completed or overdue. Click the Manage tasks button or the title of the plan on Content → Plans. Click the Edit button next to a task that you want to change.